Publisher: Alfred A. Knopf, an imprint of Random House Inc.
1. How old is Eragon, and what did he originally do for a living? 2. Why did Eragon pick up the blue stone in The Spine and bring it home? 3. What story does Brom tell at a trading gathering? 4. What is the dragon’s name? 5. Why is Eragon leaving carvahall? 6. Why is the King wary of Eragon? 7. What is Eragon’s fortune? 8. What are Eragon’s dreams about? 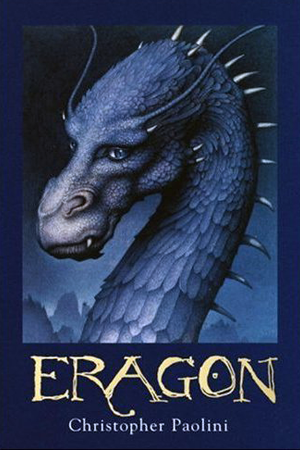 9. Who does Brom and Eragon meet during their travels? 10. Where was Eragon taken after being captured by the Ra’zac? 11. What is wrong with Arya (the elf)? 12. Why does Murtagh refuse to meet the Varden? 13. Who is the leader of the Varden? The elves? The dwarves? 14. Why was Arya angry at the Twins? 14a. Arya was angry at the twins because in order to perform the task that he was (unjustly) set to do, he had to know his true name. If your true name is known, the person who knows can easily dominate you. The Twins were trying to trick Eragon and use him to their advantage, and Arya knew it. 15. Who wins the battle in the end? 15a. Eragon’s side won (for the time being) but was scarred for life (literally). He also realizes there is more danger to come.